Everything turns up on video. Too bad for United Airlines and for the Chicago Airport Police, which provided a textbook example of how not to treat your customers, and how not to respond once you’ve treated them miserably. Millions of people have watched the video of poor Dr. Dao, a United Airlines passenger from Louisville, being ripped from his seat—his face bashed against an armrest—and then being dragged down the aisle like a bag of garbage. People hate the airlines for so many reasons, and this incident gave them the perfect opportunity to vent their pent-up frustration over cramped seats, baggage fees, and unexplained flight delays—as well as the guy seated in front of me on every flight who reclines his seat and keeps pushing to see if it will go any farther. You can look at this incident from lots of perspectives, and people have written about it from many different angles. For me it fundamentally is about customer service, which is something we are justifiably proud of at the School. I don’t want you to think I’m concerned about a public official being forcibly removed from the Wicker Classroom. Instead, I see this incident as an opportunity to learn from the mistakes of United Airlines and to reinforce our existing values about how we treat public officials. Mistake #1. We are going to force our customers to give up their seats against their will for the convenience of our own employees. Who honestly thought that was a good idea? Our first responsibility at the School is to our customers rather than to ourselves. 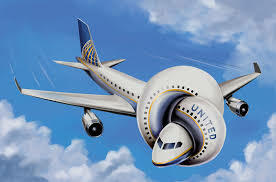 United needed to resolve things before anyone boarded the plane. If that wasn’t possible because people didn’t accept the incentives that were offered, then figure out some other way to meet your interests without inconveniencing your customers. Even if it costs the company more money. The interests of the School’s customers should come before our own interests—even if it is less convenient or more expensive for us. Mistake #2. Rule are rules and they must always be followed. It is not always easy to know the rules or how to apply them, but the airline’s employees apparently thought they were following the rules in asking the police to forcibly remove Dr. Dao. If you are confronted with a situation in which a hard-and-fast application of the rules will make one of our clients unhappy, and you intuitively feel that their unhappiness is justified, then don’t follow the rules. The rules can never anticipate every situation and they are not infallible. I trust you to do the right thing in making our customers feel welcome and well treated. You do a great job in serving our clients. Somewhere along the way United Airlines lost track of customer service—not to mention basic common sense. The organizational culture did not encourage employees to exercise their best judgment in ways that would serve the interests of their customers. You don’t have to do something that makes no sense just because the rules authorize you to do it. The case of Dr. Dao is a cautionary tale. Please continue exercising your best judgment in solving problems as they arise at the School. Rules are helpful most of the time, but don’t follow them slavishly when your common sense tells you that something else should be done. If you are United Airlines, it turns out there may be something worse than snakes on a plane.